We have looked at Kilele, We Take Pictures Too, Arab Image Foundation, Greater Middle East Photo, Space Cadet, Street Level Japan, Kantor Berita MES 56, Japan Exposures, Invisible Photographer Asia, my new notebook, oitzarisme, La Fototeca, ZoneZero, Panoramica Galerie, reminders: I WAS THERE, Asian Photography Blog, Black Man Ray, Perú Foto, foCo, and Revista Nuestra Mirada. Today we continue with Galli Magazine. In a sentence: An online space dedicated to showcasing the best of photojournalism and documentary photography from India. Every two weeks Galli publishes a portfolio of roughly 10-20 images with a desciption of the work written by the photographer and a short biography. The work is all made in India, although Galli does not restrict itself necessarily to Indian photographers. Galli also has a map page which provides a geographic format for exploring published work. 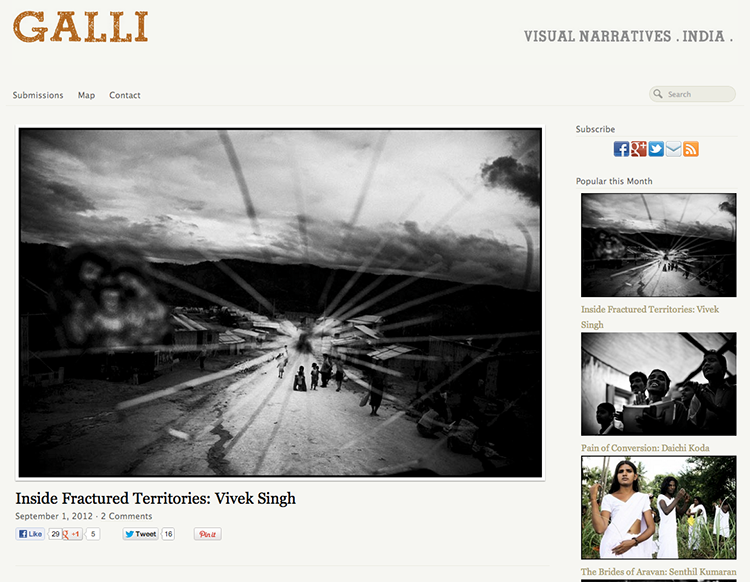 The site was invited to be a nominator for the Prix Pictet prize 2012 and was recently featured in PHOTO Magazine, France as the first site for photojournalism from India. Galli Magazine can be found on Facebook and Twitter.